Noodles are excellent in soups and dishes like casseroles. Noodles are easy to make but by simply adding a sauce or meat can make a hearty, filling meal. Enjoy these Pennsylvania Dutch and Amish noodle recipes. Share your Amish Noodles Recipes here. This simple recipe will make enough dough for a large quantity of noodles. Add salt to the eggs and work in enough flour to make a stiff dough. Knead thoroughly. Divide into 2 portions and roll each out as thin as possible, on a floured board. Cover with cloth and let stand until partly dry. Roll up the dough and cut into ¼ inch strips. Spread out on paper to dry a little longer. An easy Amish egg noodle recipe. A hearty, classic spaghetti recipe. This meatless Amish spaghetti recipe will serve four. Boil noodles in salted water until tender. Drain and place in well-greased ring mold. Melt the butter, add flour and blend smooth. Stir in milk and cook, stirring constantly until it thickens. Add seasoning and cheese cut in small pieces. Cook until cheese melts. To ½ of the sauce add the well-beaten eggs and mix well. Pour this over the noodles. Set mold in pan of hot water and bake for 45 min at 350 degrees. Unmold on large platter, pour over the remaining hot cheese sauce. Fill center with peas, and carrots or spinach. The German name for this dish is “Leberknoedel”. Simmer the liver in boiling water for 30 minutes. Then trim off any skin or ligaments and grind the liver fine. Season. Mince the onion, add the butter, beat the eggs and add them. Work into this paste the flour, using enough to make the paste quite stiff. Form into small balls and poach them in any meat soup for 15 minutes. Serve them swimming in the soup. The following two recipes are for delicious stuffed noodles, made with spinach, and below, meat filling. See one of the egg noodle recipes above to make noodle dough to be cut into squares as required in these two recipes. Make a recipe of noodle dough (see above). Roll thin, let dry and cut into 3 inch squares. Brown meat in hot fat with the onion and seasoning. Soak bread cubes in water and press dry then add to the meat. Spoon mixture on the center of the noodle squares, and .proceed as above (as described in Noodle Spinach Filling recipe). Share your Amish Noodles Recipes in the Comment Box below! 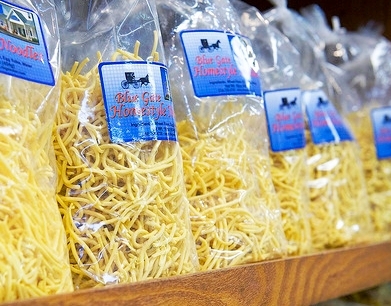 Please type recipe title (ie, “Amish Butter Noodles”) in the “Comment Title” box. Recently I made a Amish noodle/spinach/meat casserole that we loved. I wrote it down and now it has gone missing. The only thing that could help is that in the title of the recipe was a German word that began with the letter ‘K’ 5 or 6 letters.